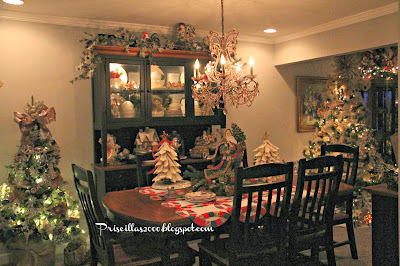 Today I am showing you our dining room decorated for Christmas ! When we remodeled in the spring we got this new dining room set , so this year our dining room looks totally different ! 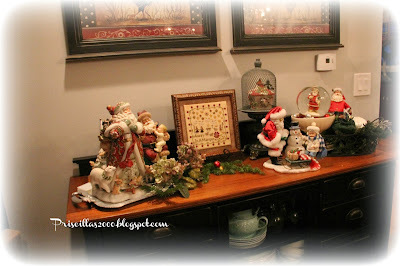 I loved decorating the hutch with Fitz and Floyd Santas, I have some on the inside as well as on this ledge and on the buffet. The glittery house is from Homegoods, I have a Dept. 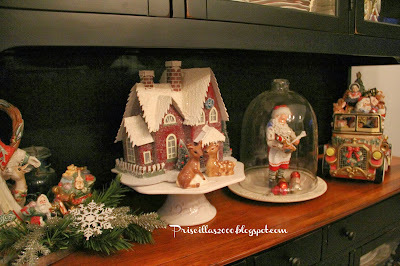 56 Santa in the cloche. 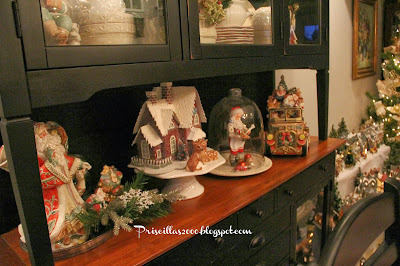 In the china cabinet , I kept my estate sale cream colored dishes, added some Fitz and Floyd , and some big sparkly ornaments in the bowls, with some greenery springs... On top I have some roosters and a flocked garland. The chandelier is amber colored , the walls are a pale grey .. It was so nice to decorate this room ! 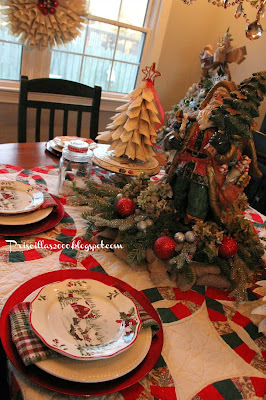 I used an old quilt for a table runner, and placed the burlap wreath I made in the center. I used a silver tray on top of that and that's where my biggest Fitz and Floyd Santa sits..he is a fabulous piece !.. 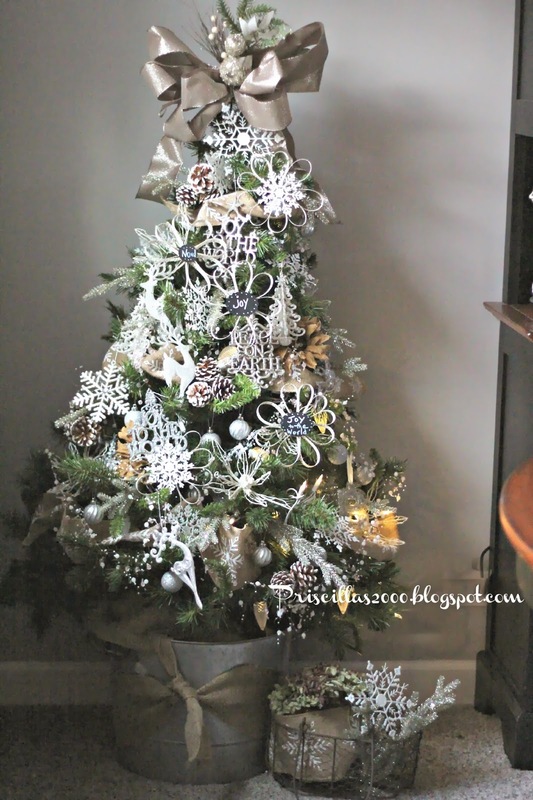 I used fresh greens from the bottom of our Christmas tree, dried hydrangeas from our garden..some platinum colored sprigs and some ornaments from the Dollar Tree. 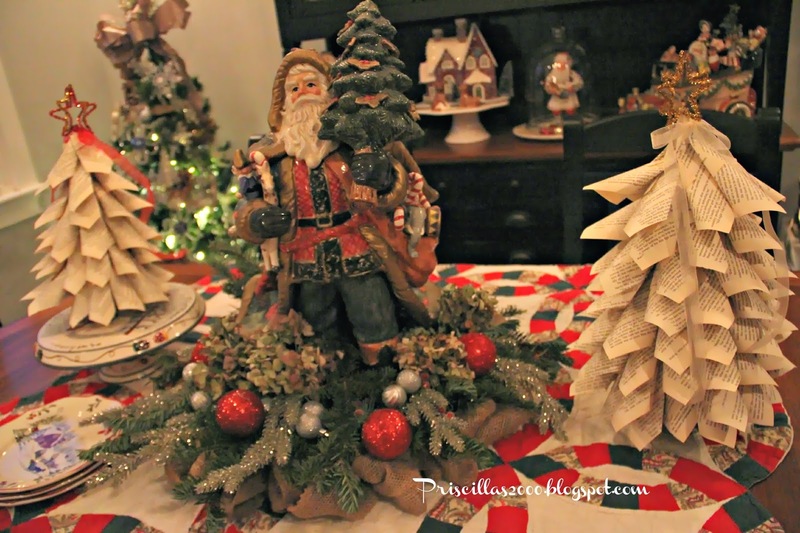 The book page trees are also on the table , one is on a pedestal plate .. There is also a stack of the cute BHG dishes from Walmart .. I got the barn scene salad plates.. Love them ! For our table setting ,there are red chargers.. I am using the white plates from Dollar Tree , with plaid homespun napkins and the BHG plates from Walmart .. 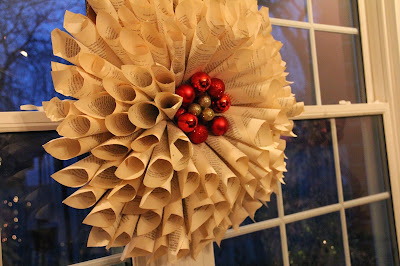 I hung this book page wreath in the window..the room has a lot of book pages going on ! I just noticed the blue in the photo..I got the blue hour look by accident ! On the buffet , there is more Fitz and Floyd , Dept. 56 Santas , and a cross stitch project I just finished. It is a Plum Street Sampler design , Mary's Sampler.. I framed it with a burlap background in a thrift store frame. This tree with the book page ornaments sits in the corner. 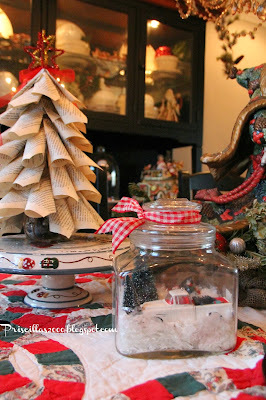 Its got burlap for garland , burlap flowers , book page ornaments , and all glittery silvery platinum ornaments ..It sits in an old galvanized bucket. 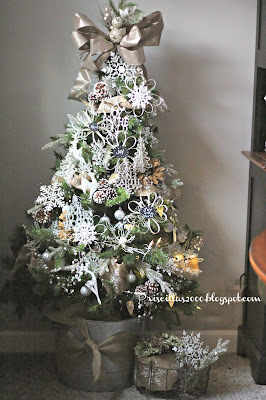 This is one of 13 trees in our house this year ! Part of the Christmas village extends into the dining room ..It is wrapped around this tree in the living room.. you can see our Christmas kitchen here.. Thanks so much for your visits and nice comments ! I truly appreciate each and every one of you ! Beautiful! 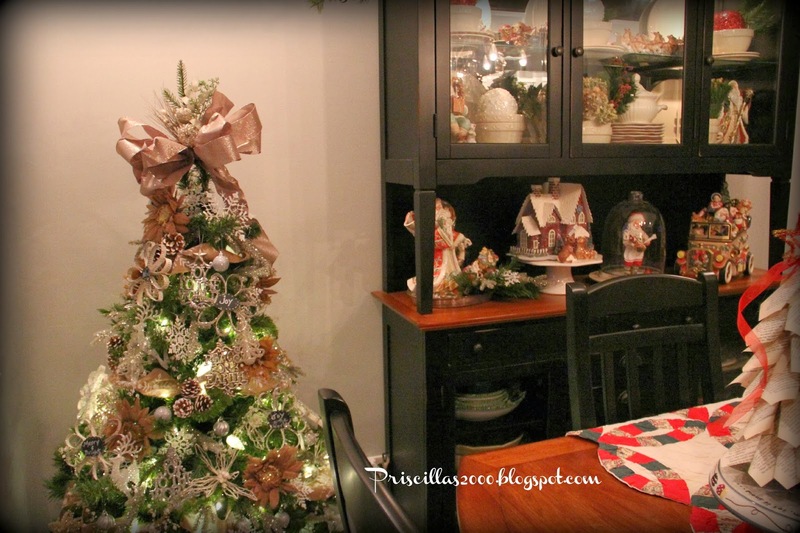 Your dining room is gorgeous, like a C'mas movie, with adorable accessories and it's own tree. The main tree is stunning too! Love it all! Enjoy this lovely holiday season, my friend. Wow! That last picture with the Christmas tree surrounded by the village must've taken you hours to put up... It all looks so festive! As I have said, beautiful! ALL OVER! Whoa! Would you come decorate our house? You surely have to be a decorator! Stunning! You could give Christmas wonderland tours throughout your house!! The dining room looks so ready for Christmas! You are very lucky to have found a frame for Mary. Oh Priscilla, it is all so magical!! I hardly know where to begin! I love Fitz & Floyd and have a few of the roosters and a few other things, but no Santas. I am not familiar with Dept 56? Your page trees are adorable! I love it all...love it! You need to be on a holiday home tour!!! Wow! That is stunning. I love that you used the quilt for the table covering and your Fitz & Floyd collection is extensive. Everything looks so festive. Merry Christmas! 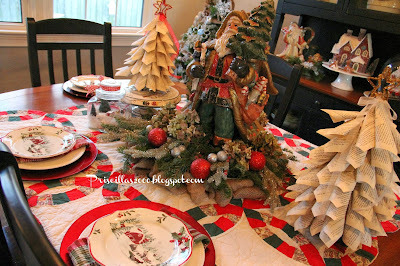 Priscilla, I love your beautiful table setting! So glad you snagged some of those cute plates before they disappeared. 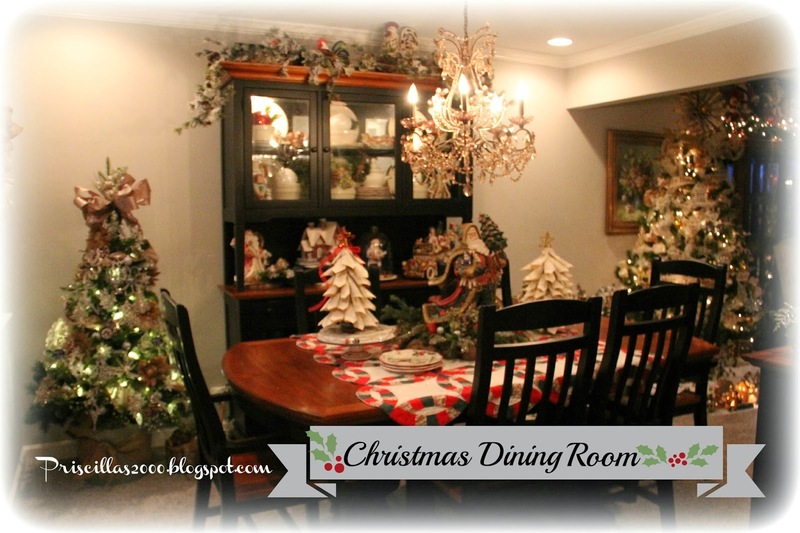 Your family will love dining here throughout the Christmas season! Your dining room is wonderful...love the new furniture and your beautiful Christmas displays. Your tree with the lit houses is stunning...took my breath away! I just recently found a Dept. 56 group on Facebook and the members have been sharing their amazing displays! They would love yours! Your collection of F/F is fantastic, as is the whole room. Your hutch is just wonderful, the way you have showcased all your goodies. 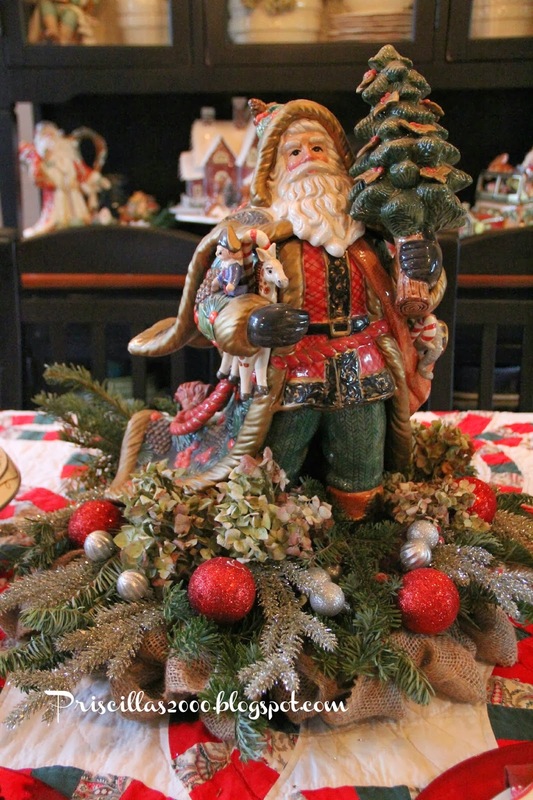 The tablescape with the F/F Santa is lovely for your centerpiece! 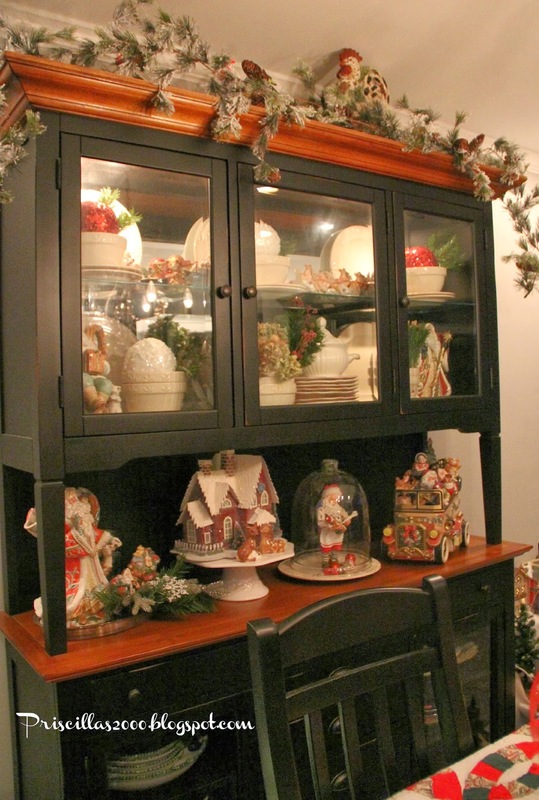 The china cabinet with the other Santas is a beautiful way to decorate. 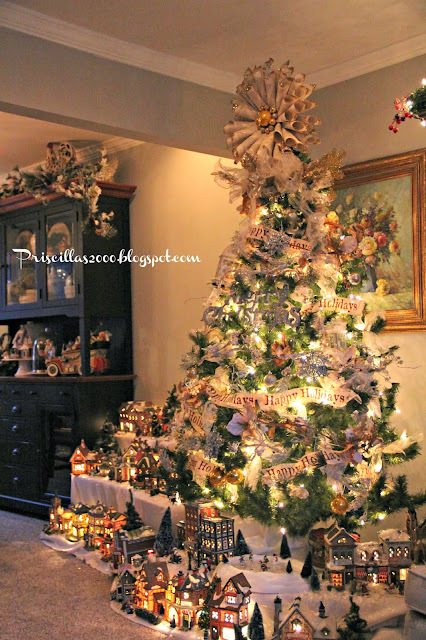 The Christmas tree with the stacked village is a new concept to me and fabulous. Your home is gorgeous and you are a creative decorator!